Glass-clad, cable-net structures are one of today’s leading forms of high-transparency facade technology. 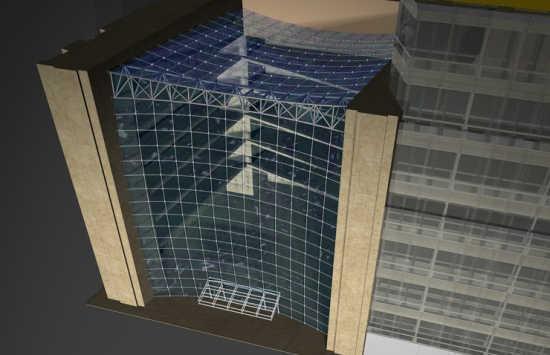 Since 2009, Enclos has been an authority in the design, engineering, fabrication, and assembly of custom curtain wall systems and structural glass facades. The company has published a number of reports about building skin systems. Volume 1: Skylights of the Facade TecNotes Series focuses on glass in overhead applications and the unique opportunities it brings. On September 11th, Enclos’ Mic Patterson will join AN to discuss glass facades at GlassBuild America: The Architects Forum in Atlanta. Mr. Patterson will share several examples that show how optimal transparency and aesthetic elegance can work together. He will discuss projects such as 51 Louisiana in Washington, D.C., two existing buildings that have been joined by a glass-clad atrium, and Station Place: Security & Exchange Commission Headquarters, also in Washington, D.C., which consists of a 55-foot-long and 60-foot-wide skylight. Mr. Patterson has lectured internationally on various aspects of advanced facade technology and is the author of Structural Glass Facades and Enclosures. Atlanta Enclos Glass Glass+Performance Mic Patterson skylight The Architect's Forum Washington, D.C.